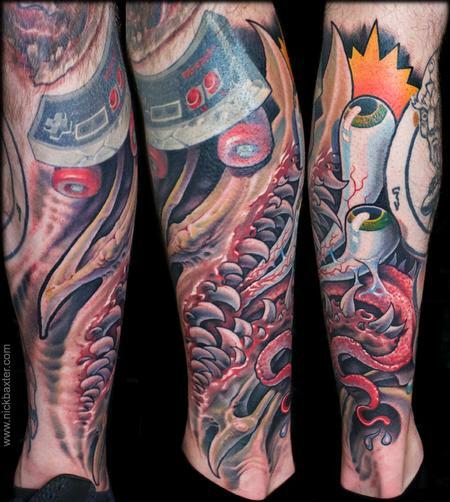 This was a ridiculously fun "skate mech" collaboration with Jeff Ensminger. Given the task of working around a skate and retro gamer themed piece by Timmy B, a creature by Shane Baker, and a rad little neo-traditional banger by Adrian Dominic, we referenced old Santa Cruz skate stickers and Tex Avery wolf cartoons to come up with a biomech piece that would be a bit more cohesive with the existing pieces. Eric sat for 6 hours X 2 tattooers—a true champion!